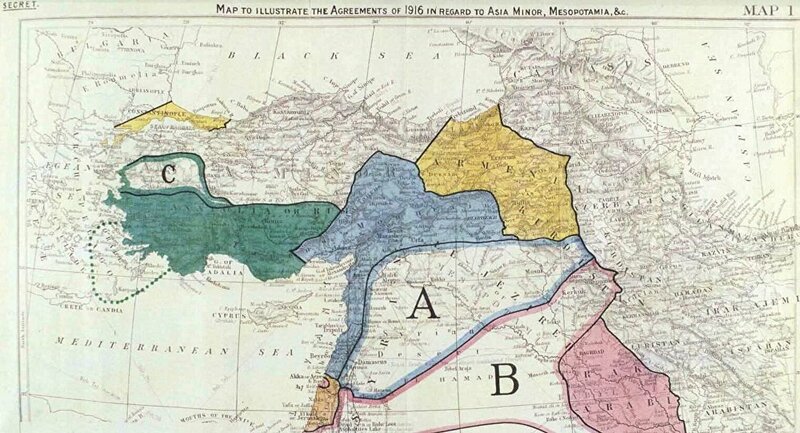 "They drew a line in the sand…that would determine that one would be for the French and the other part would be for the British," Kara-Mustapha tells Loud & Clear, describing how the Sykes-Picot agreement was drafted by London and Paris at the end of World War I to divide the Middle East in a way that benefitted those nations. "The problem with this is that it puts together communities, ethnic groups, that were not naturally inclined to live together," she says. "What it really did, in effect, was set the region up for inevitable civil conflict." European powers planned to exploit the region’s riches, oil in particular, and the while the United States was not directly involved in the Sykes-Picot agreement, it did benefit. "[The US was] granted, in the final agreement, 23.75% of Iraq’s oil," Becker says. "23.75% went to each Britain, France, and the Netherlands, together, leaving 5% behind, of all of Iraq’s oil, and that went to a man named Calouste Gulbenkian, who brokered this deal. "That left Iraq with…0% of Iraq’s oil. Which is why Iraq, despite all of its great natural resources, in the 1950s was one of the most destitute, poorest countries in the world." Sykes-Picot was followed shortly by the Balfour Declaration, a letter from UK Foreign Secretary James Balfour to Walter Rothschild, which laid the groundwork for the creation of a Jewish state in the Middle East. "This lord in the British House of Lords indeed promised something that was never his, to people that were not all his, to the detriment of another people who were not even consulted about this," Kara-Mustapha says. "The Balfour Declaration epitomizes imperial hubris and the idea that you can just dispose of any land to the detriment of its inhabitants in any way you see you fit, irrespective of the consequences." While Western narrative paints the creation of Israel as a solution following the atrocities of the Holocaust committed by the Nazis during World War II, Becker points out that it was more accurately the result of European anti-Semitism and attempts to prevent a revolution. "Churchill was such a profound racist and imperialist, he believed that…all the problems that have been caused…has been a worldwide conspiracy for the overthrow of civilization," Becker says. "In all those cases what he’s saying is that it’s Jewish people who are responsible for what he regarded as terrible events in history. "His answer and his reason for supporting the Zionism that he gave then…was that this would divert Jewish people away from revolution and in the direction of something else that could be very useful to the British Empire." The effects of Sykes-Picot can still be felt today, as Western powers continue to invade and intervene in Middle Eastern affairs. "I think this is the basis of capitalist warmongering. It’s supply and demand," Kara-Mustapha says. "You create the chaos for which you then go on and provide the arms, the mercenaries, the security firms, selling the arms to the two warring parties."